Tell the Truth about What Will Happen Next: Before you decide to tell your children, it’s important to have a discussion about what happens next in the transition. Your children will have anxieties so setting realistic expectations and following through on those expectations is very important in keeping them calm. The goal is to present a unified front where promises aren’t made that can be broken. Don’t Play the Blame Game or Offer Sensitive Details: Your children will want to know why you are getting a divorce. First and foremost, it’s important to reassure them that it’s not their fault. At the same time, though, you shouldn’t assign blame to one person as this could cause your children to choose sides. Instead, you should only offer relevant information on things you feel your children need to know and avoid any badmouthing or overburdening them with too many details. Ask for Help: It’s not a sign of weakness if you decide to ask for help. Benny Rogosnitzky co-founded Frum Divorce, for example, to help frum families in their time of need. 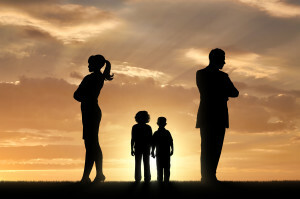 Benny Rogosnitzky knows divorce can be extremely difficult for everyone involved, and Frum Divorce offers a variety of programs for children in particular. This is just one organization that can provide help. You can also seek assistance from family and friends, a rabbi or another religious figure, or a professional mental clinician who specializes in family issues.